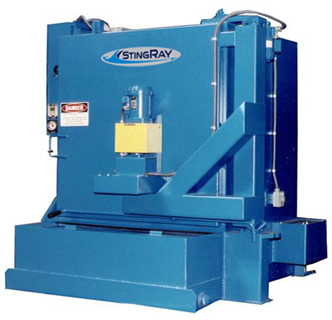 The StingRay 5248 aqueous parts washer is engineered for tough cleaning applications. The large heavy duty 52" diameter turntable machine is heavy duty and features high parts washer power density for removing paint, oil, grease, hydrocarbon deposits and more. Used in rail, over the road and off road rebuilding of engines, transmissions and associated parts. Automated aqueous parts washer utilizes unique oscillating spray manifold and high pressure to over power the soils.